MONTREAL – Cantrex Nationwide Group (CNW) was recently named the 2017 Alpha Award winner for in the business service sector by the Chamber of Commerce and Industry of Saint-Laurent and Mount Royal. The privately-held buying and marketing group, a wholly-owned subsidiary of the Winston-Salem, North Carolina-based Nationwide Marketing was cited in the category’s ‘more than 50 employees’ section. The Alpha program is designed to recognise excellence among the chamber’s members. 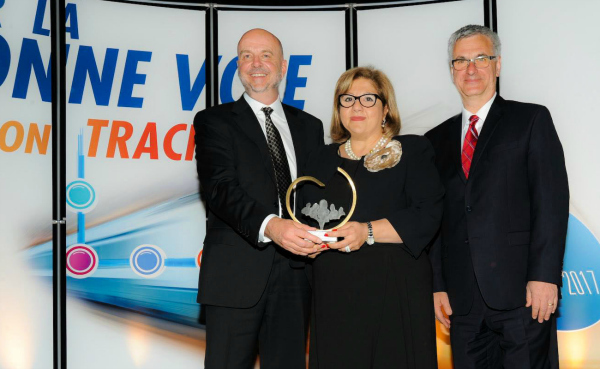 Jeannine Ghaleb, president and chief operating officer, accepted the award on behalf of the company’s employees, members and vendor-partners. “I would like to thank our employees for their continuous hard work and contributions to the success of Cantrex Nationwide,” she said. “Independent retailers have an important role in our economy. As entrepreneurs and innovators, they build our vendors’ brands, employ our population and are often the foundation of our communities. I invite everyone to continue supporting your independent retailers and thank you for your trust in our organization,” Ghaleb added, speaking to an audience of dignitaries, provincial government officials and business people from the Saint-Laurent and Mount Royal communities.